If your business or venture is aiming to create a physical product for your customers, you may be wondering how to translate the idea you have into a physical product you can touch. And if you are interested in creating a service, how do you turn it into action? Wherever you are in the process and even if your prototype is still a sketch on the back of a napkin, don’t be afraid to help you take the next step to bring your dreams to reality. A guiding principle to follow is to always remember how you are solving your customers’ problems. You may have multiple solutions for these problems, but having a clearly defined idea is key. You don’t have to have the perfect offering right off the bat. You will most likely go through lots of iterations and versions of your product or service before you decide it is good enough to be sold. Aim to get to a sample so that you can make your first sale. Create something easy to show your idea, like a description, sketch, photo, website, etc. to share with potential customers. Get their feedback so you can make fast changes. 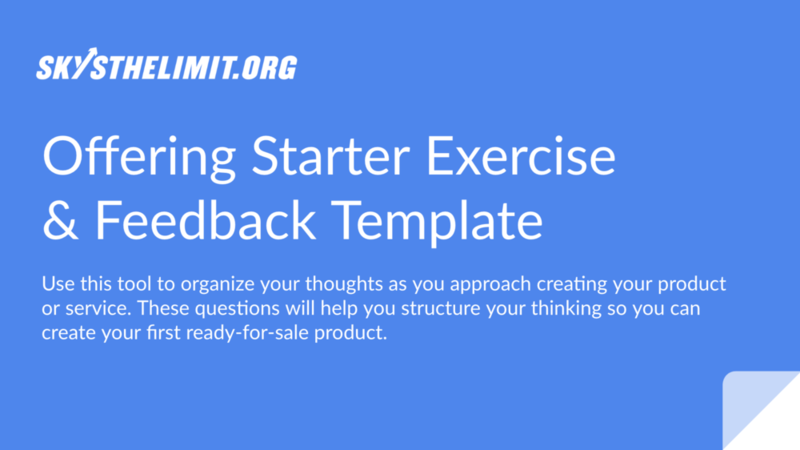 Create a sample of your product or service to share with potential customers to get their feedback on improvements or further changes that need to be made. Improve your sample until you’re satisfied it is something that your customers will buy. Start with your first set of potential customers and ask them to spread the word. Use this guide to help you with the creation process.